Mahendra Singh Dhoni is a great inspiration to me. I am always on the look out for people who rise in ranks, faster and stronger than others do. When India won the Twenty20 world cup, what touched me most despite the fact that the boys played well, was Dhoni’s heart winning performance and speech. Following up on Dhoni I found an underlying success philosophy which can easily be applied by anyone who aspires for greatness in his or her field of endeavor. Dhoni knew that at the Twenty20 no one expected them to win, and so his philosophy was that they could actually play and have fun and make this their best game. I have heard many a professional say that their seniors don’t encourage them or push them forward. They use this excuse to remain where they are and lay the responsibility of their success and progress on everyone but themselves. Dhoni led his team to success, by taking up the responsibility of their victory, when no one else had faith in them. Respect and Recognize your team:As a captain Dhoni has tremendous respect for his team and his players. Even on winning he addressed Yuvi as the Trump Card of the team. I have seen seniors hog the glory of their teams success by themselves. Dhoni knows that what leads the team to victory is the team, not necessarily the captain. And he is humble and fair enough to put the credit where it really belongs. I love Dhoni’s attitude where he was aware that he didn’t have good bowlers like Bentley, but he banked on Jogender Sharma. Even though others said he was slow, Dhoni stuck to his belief that to win you don’t have to be quick or extra ordinary. If one bowls in the right places it will add to the victory of the team. Dhoni is amazing, he believes that you don’t need extra ordinary talent to be a winner; you need to play the right game. When you do your work well, and well enough consistently, victory will always be yours. A lot of people use lack of talent and expertise to remain in mediocrity. They feel they are too old, too young, too slow, too fast, too fat, and too thin, as excuses for their mediocre thinking. If your mind is made up, then nothing else matters. Dhoni’s belief is a true example of that. I also love the fact that once Dhoni makes a decision he is willing to live with the consequence. He made a decision that Joginder bowl against Harbhajan Singh. He was prepared to win with it and prepared to lose with it. I feel that is an amazing attitude. A lot of people make decisions and then they are not at peace with the results. If you can make peace with failure before you play to win, nothing can take victory away from you. At the Twenty20 finals, Dhoni He didn’t want the team to work under pressure. He told his team this in every meeting, “Guys we are out here to enjoy. We will give our 100% and whatever is the outcome, I don’t care about it.” There was no fear amongst the youngsters, which was so refreshing to see. He told Yuvi that even Australia was under pressure because they have the reputation of winning. He took the pressure and converted it into passion, and we saw that so evidently on the field. Take all of your pressure and steam it off in fun. Having fun doesn’t mean being irresponsible, it means working with your best self. When Dhoni was asked, how he plans to maintain his position of India’s captain, he said, “We will win more matches than we lose.” He didn’t say that he will win them all, because he knows that losing is a lesson towards winning. A lot of us drive ourselves crazy by expecting to win every time we get on with our work. There will be good deals and bad deals, good days and bad days; success is about creating the good ones more often than the bad ones. When you go out and deliver your best, there is a catch. You now have to deliver excellence consistently and it also raises the expectations of your seniors. Dhoni is every aware of that after his mega innings at Vizag against Pakistan. He knows that he gave his 100 percent in that and that it was his BEST performance. He also knows that has raised the expectations of his fans from him to deliver that consistently. And he is working hard on himself to deliver to that expectation. No matter how hard your day, be consistent in your delivery if not better. Dhoni started out as a footballer and that training helped him in cricket too. There is really no waste in practice and knowledge, it’s like a universal formula, Success in one area, training in one area always finds use in another. There are no wasted moments or experiences in life. You can use success strategies of one area to help you win in another. Dhoni is an expert in that. You have surely been a success at some area or the other in life, use those principles and duplicate it in your work. One lady won the national level badminton championship, the principles she used to win the championship can easily be translated to her work profile. Try it, if it works for Dhoni, it will work for you. Dhoni attributes his success a lot towards his physical fitness. And it is true for anyone, if you are not fit; you can’t be a hit at anything that you do, period. With people taking their bodies for granted, they expect their mind to work magic. The mind lives in the body, to deliver peak performance in any area of work, you need to be physically fit. Dhoni always aspires to out do himself. He sets a record for himself and then aspires to beat it. His philosophy is that if he can score just one more run like he did 148 in Vizag, then he can continue to be his best. He feels that if he can do it once, he can do it again! That’s the spirit. Whenever you deliver work well done, your next strategy should be to repeat that as many times as you can. Repeated success is true success. If you can do it once, you sure can do it again. Dhoni is an aggressive right-handed batsman and wicket keeper. Dhoni is one of the wicket-keepers who have come through the ranks of junior and India A cricket teams to represent the national team He worked his way up and was consistent in his performance that was the crucial key to his selection in the Indian Cricket team. Don’t be afraid to start at the bottom, that is a more stable way to the top, to have been through every rung. Dhoni believes in constant and never ending improvement. Success and victory don’t go to his head. When he wins he celebrates and then right after that gets down to practice on how he can do better in order to maintain his score if not beat it. Success is not an accident, it is a planned event, “My mind is constantly working on how I can get better at my game. My mind never stops.” Says Dhoni. Finding better and new ways to do the same thing that you are doing will keep you creative and excited. Either you are improving or you are deteriorating, progress is success. Dhoni is always bubbling with enthusiasm. His spirit is evident in his voice and his face. It’s great to see someone so alive and so passionate about his game. Today what meets the public eye is the glory, but what they cannot see is that there was also a road full of obstacles that led there. It sometimes is a dark lonely road and you have only your own desire and courage that will bring you to the light. Dhoni, a Ranchi boy who through his sheer courage and focus made the country proud is an example of the unshakeable enthusiasm and spirit. Make enthusiasm and excitement a daily practice. When Dhoni was given a chance in the one-day series in Bangladesh, though he did nothing extraordinary in the three ODIs against Bangladesh, it was only a matter of time before he exploded on the big stage, and that happened at Vizag . So success doesn’t come instantly. There will be hitches and glitches and bad games and not so good games. You have to be at it until you strike the balance and then maintain it. Life is always a learning experience and success is about putting that experience to get better. Self-confidence has always been a trade mark of Dhoni’s personality. I have always seen him very confident and aggressive. And it applies in his batting as well as wicket keeping. Self confidence is a learnt personality trait; it comes from constantly challenging oneself, winning or losing, not being the criteria. Self confidence comes in facing one’s fears and moving ahead despite any and every odd. Challenge yourself daily, to be bigger and better than you are today. Dhoni is a pro at multi tasking. He is an ace batsman and also an ace wicket keeper. So can you imagine the level of practice he needs to do in order to achieve mastery in both? It’s like having a group of companies under your umbrella and make them all work. It’s like excelling as a CEO and excelling as father. It’s a full game when you excel in all your roles. Dhoni believes that he can't afford to be less than 100 percent in any of the two roles. He feels they complement each other and give him his identity.” Same way, one has to give 100% in any and every role that they play. All roles shape our identity. When Dhoni aspired to play test cricket, his focus was “I think if I perform well, and maintain my form, I will definitely get a break in Test cricket.” A lot of people want many things in life. Their focus becomes the achievement and they feel that it must be served to them just because they want it. To achieve your desire you need to perform well and maintain your form. You get noticed for your performance not your potential and Dhoni put his potential into performance and earned his space in test cricket. Have a role model:Dhoni has a role model, the famous cricketer Gilchrist, do you? How arrogant can someone get not to acknowledge that they need a helping hand, a little guidance and a role model? All successful people have had someone they looked up to. They have followed enough to be good leaders themselves. Leaders are not born, they are followers who find their own identity in the journey, and hence lead by their own transformation. In today’s world of abundant negativity and insensitivity, a role model is so important for one to stay focused on his task. And there is always room for superstition. Superstition that anchors you to success, for that matter anything that anchors you to success is good. About a year ago Dhoni decided to change his hairstyle completely. Besides giving him a distinct personality, he feels the new hairstyle brought him luck as well! It’s ok to have superstitions that support one’s mind towards success. Goodness is any form can never do any harm. Letting go is one of the hardest ordeals for many of us, especially me. Forget whether letting go is for the good or bad, just the thought of not having "that" as a part of your life anymore, is a heavy feeling. Whether that "That" is smses in the inbox of an old phone you dont want to throw, or telephone numbers of people you havent called in the past 3 years that you dont want to delete, or an employee you must fire but dont find the heart to, or the abusive partner that you must dump but dont have the courage to, or the mundane job that kills your soul but you dont have the confidence to find a new one. I dont know what the attachment to the dead and useless is, but it is pretty real to cause us pain. I do firewalks and where I encourage people to confront their fears or things that they feel will deliver them pain. The magical part is when you confront your fears and pain, it miraculously transforms into fun and pleasure. I tried this with my phone. I have over 4000 sms in my old phone, which I absolutely will not get rid off because I may "need" to refer to those messages. I realised after one month that I had not once refered to my old phone. So in 30 days I have not "needed" something I have considered so important. A friend of mine who is the M.D. of a company wanted to fire one of her employees, but she feared the "loss" it would create in her organisation. Then one day, the employee resigned and left. Within 3 weeks they found a replacement and there was no real "loss" as my friend had anticipated. I am led to consider a different perspective. We give too much importance to things around us. We get attached to people, things, places, weather, technology to the point that we interconnect our dependance on them completely that we sometimes forget the power of our own spirit to re-create and move on to higher grounds. I have begun to consider that life is a journey and people, places, things will not stay in our lives forever. Some will stay longer than others and eventually all will go. So if i can treat people and things with respect and dignity in experiening them while they touch my life and also in letting them go, I will always be connected to my self, which IS the real connection. When you let go with grace and allow the person or thing their freedom towards their journey, you will never lose them, they will always visit you back. It is when you want to own anothers time and space that you restrict them enough to move away and never return. Letting go is a virtue of allowing.... allowing others a right to their own journey, freedom and learning. I feel the journey of connection is inward not outward. As long as that connection is strong, letting in and letting go would be an attitude of service rather than possession. The New Year brings in celebrations and aspirations. I have observed that it is during this time that people are most motivated. It is as though the 1st of January has given them a second chance to life. It is as though what happened in 2007 can be history and the future ahead is a worthy of achievements. This is the time of the year where even the meekest soul steps up and makes a resolution for a better life. Did you know that fewer than 10% of people who set New Years' Resolutions actually achieve them? How can you ensure YOUR success this time? Try using the Tips below and you will surely move on long enough to make your resolution a reality. 1. Write Them Down. It's a fact: writing down your goals gives you a higher chance of success. 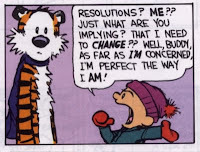 A lot of times resolutions are verbal. Writing your goals down brings clarity. 2. Commit. Move beyond the land of "good ideas" to the land of true "commitment". Make the decision that you will show up for your goals. Perhaps you can do a ritual or ceremony to symbolize your commitment. When I made the resolution of getting a fitter body for 2008, I joined the gym. Paying money for your goal is a good commitment sometimes. 3. Tell People. Let your biggest fans in on your new commitments and goals for the year. Telling people about what you want to achieve puts pressure on you to deliver. 4. Get Accountability. Even better than just letting others in on your "secret" dreams and goals-get some accountability. Meet for lunch once a month with a group that will ask you, "So, how's it going with your goal?" Hire a Coach. Talk to your best friend or partner. Get some support! 5. Make a Plan. Ensure success with a step-by-step plan. Work backwards by starting with the end vision of where you want to be and working backwards to where you are today. You'll find an easy action plan to make your goals a reality. Many goals and resolutions fail because there was no plan of action laid down to mark out the steps it would take to achieve your goal. 6. Do a Goal Check-In. Before you decide on what you'll take on for the year, make certain you can answer, "YES!" to the following questions: "Am I the primary reason for setting this goal (vs. your mom, boyfriend, wife, boss, society)? Do I feel alive and energized by this goal? Is this goal in line with my life purpose or mission?" 7. Get Real! If you're contemplating putting a goal down that you always put down and never achieve, take a second look. How will this goal end DIFFERENTLY this year? Is this goal something you need to let go of? What purpose is it serving you each year? What is the good enough reason to truly commit? 8. Focus With Reminders. Once you've got your goals and plan in place, figure out ways to remind yourself. You can post your goals on the bathroom mirror or in the car or you can even put reminders on your cell phone. Figure out what works for you. 9. Believe and Visualize. Do you know the story about the group of basketball players who spent one hour visualizing making baskets, while another group actually practiced? The visualizing players had better seasons! So visualize yourself on days into the New Year with all your goals achieved. What would that look like? How would it feel? Visualize once a day and see the difference it can make in your life. 10. Treat yourself: Every time you take action towards your goal, treat yourself. It is said that true success is in the journey not the destination. So each time you set yourself on the journey, treat yourself. May 2008 be the year that your goals and dreams reach full flight! Nupur said: I agree following your heart is the best thing...but at times it might not be the smartest thing to do cause it seems that the heart lives for the today, and the decisions made may cause you pain in the future which only the brain can rationalize. Any thoughts on the same??? Following your heart is the one thing which will lead you to success. When you follow your heart, you are doing the right thing. And you know you are doing the right thing, because all that you do and say is for the highest good. When you follow your heart, you are not the sole beneficiary of your actions and goals. You will see your family, your friends, your colleagues and the society at large benefit. But if what you do is only easing your heart and causing inconvenience or upset to those aroound you, then maybe you need to take a rain check on what is going on and in which direction your contribution and intention is moving. The rule of the thumb is that when you follow your heart, you spread love, because that is an expression of the heart which will show up in your work. And it not only engulfs you, but affects all those who are connected with you. I often sit down and wonder, on what really is the purpose of one's life ? What purpose could i possibly have come to fulfill on this planet earth ? And I feel that the real glory of being alive, is to follow your heart. The heart is the only organ of the body, that when it stops, it brings an end to all other organs, including the body itself. So our heart keeps us alive, and in my perspective our heart also directs our life. Following your heart to me means doing what one feels is the right thing to do. Often times we suppress what we feel is the right thing to do just out of the sheer fear of being judged. Often people ask me how i made it so far, so young. And I guess I have only followed my heart in all that I do, and in all that I dont do :O) It's a choice that I have made, and not that has been made for me. I feel that true success lies in living your life your way, on your own terms, following your own heart, not someone else's. Those who spend their lives chasing other people's dreams, following someone else's heart, are the one's who land up with their own messed up. In my company, we have like minded people. Everyone works because THEY WANT to, and not because they have to, and thats I guess is the biggest reason of our success.